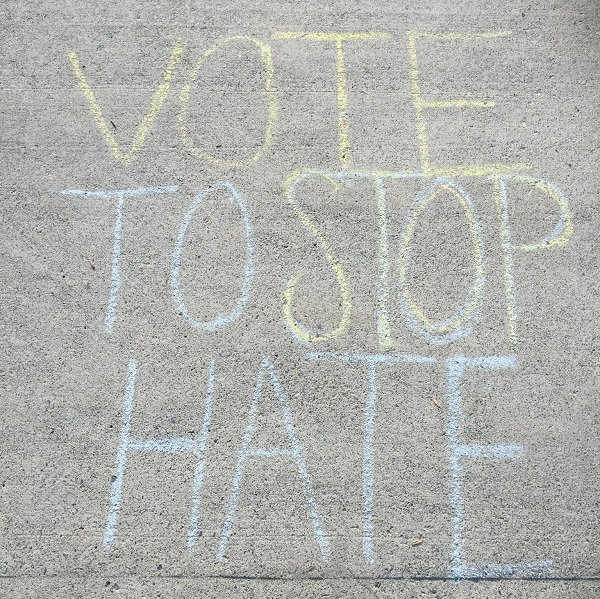 “Vote to Stop Hate.” Sidewalk chalk message outside SciTech on election day, Nov. 8, 2016. The day I became a citizen of the United States of America rests in my heart as one of the most beautiful and significant days of my life. I stood in a room with thousands of people of all races, faiths, national origins, shapes and colors, and together, we took an oath to support and defend the Constitution, and if needed, that we would bear arms in order to defend her with our very lives. I didn’t hesitate one second. Oh my word. I was caught off guard by an eruption of emotion that vigorously rose up my throat. I felt balance betray me as my hands begun to tremble and my knees got weaker. The song, 1984’s “God Bless the USA” by Lee Greenwood, continued . . . There, standing in the middle of a crowd of thousands of my now closest friends, my heart won the better part of me and let out a dance of tears which waltzed down my face. My chest had no composure. The love I felt for this country, and the love I felt this country had for me, was nothing short of overwhelming. Self-control be damned! Oh, dream of dreams: I was now an American. I was home. To make the experience even more memorable, oh surprise, a special guest showed up on a video projected onto the giant screen. And that regardless of color, religion, social status, or any other difference, this was our family and that we were loved and welcomed by it. And after Jan. 20, 2017, there will be millions of new people who will, like I did, come into a room as strangers and will leave as members of the great American family. They will hear the song I heard, and pledge the oath I pledged. But they will be welcomed by a different face on that screen. A new president will say they are now part of this family. I write this today with a new set of tears coming down my face—this time not waltzing at a dance—more like a funeral procession. The family I love decided that, out of TWENTY-TWO candidates on all levels of the political spectrum, the most divisive and offensive character our history has seen would be our face. His mere last name—five simple letters—is now a symbol of hate many of his followers use to vandalize the places where minorities gather. How will my new American brothers and sisters feel when they see the face that made a success out of turning hate against them, standing at the door saying, ‘come in’? Will they really feel like this is their America? Will they really believe this is their home? On the morning of November 9, I woke up, like many of you, with a sense of shock that could resemble a time of tragedy—the day after a death in the family—or even, love help us, a domestic terror attack. We were scared, terrorized really, at the thought that our own American brothers and sisters had chosen, out of TWENTY-TWO options, the face that incited more fear and hate then anyone before him running for office. “I thought they loved me,” many of us thought. So I come to you asking for help. From the religious and atheist, from the gay and straight, male and female, the rich and broke, the rural and urban, the young and old . . . Elections come and go. In four years we’ll have another. And another four years after that. But have we declared and institutionalized that is perfectly acceptable to terrorize, and basically mob lynch, those who are different in order to get our attention? Is there really any promise that can validate a personal attack on your family? America is not a chunk of land or a pile of dollar bills. She is a family who cheers and cries, who argues and laughs and who celebrates and mourns. America is a family—granted at times a tat dysfunctional—but a family nonetheless. Will you again allow someone to rise and slap yours around, even with promises of better jobs? Will you take an oath to defend your family with your very lives? Cause if you stand with me and choose to put family first, then . . . I gladly stand up next to you and defend her still today. Cause there ain’t no doubt we love this land. It is up to us my brothers and sisters—it is up to us—WE are the ones who bless or tear this little family we call: U-S-A. Fernando Alcántar is the author of the book, To the Cross and Back: An Immigrant’s Journey from Faith to Reason, and member of the beautiful rainbow colored family we call ESU.